This vegan banana nice cream is so easy to make and no churn required! 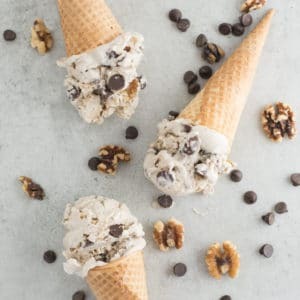 Packed with chocolate chips, walnuts, and a smooth banana and coconut base, this dairy-free ice cream is the perfect sweet treat! Make sure to put the can of coconut milk in the fridge and banana slices in the freezer in advanced! Preferably the day before.